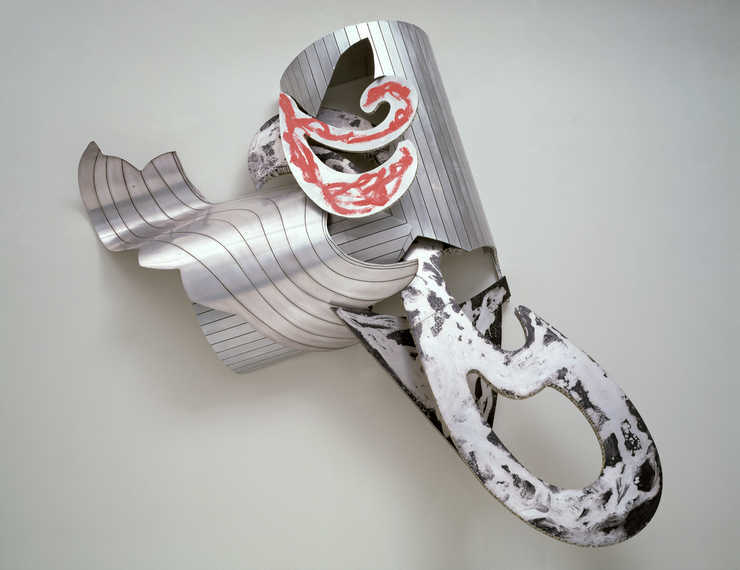 The most comprehensive career retrospective in the U.S. to date of the work of Frank Stella, co-organized by the Whitney Museum of American Art and the Modern Art Museum of Fort Worth, will debut at the Whitney this fall. The exhibition will be on view at the Whitney from October 30, 2015 through February 7, 2016, and at the Modern Art Museum of Fort Worth from April 17 through September 4, 2016; it will subsequently travel to the DeYoung Museum, San Francisco. Frank Stella: A Retrospective brings together the artist’s best-known works installed alongside lesser known examples to reveal the extraordinary scope and diversity of his nearly sixty-year career. Approximately 100 works, including icons of major museum and private collections, will be shown. Along with paintings, reliefs, sculptures, and prints, a selection of drawings and maquettes have been included to shed light on Stella’s conceptual and material process. Frank Stella: A Retrospective is organized by Michael Auping, Chief Curator, Modern Art Museum of Fort Worth, in association with Adam D. Weinberg, Alice Pratt Brown Director, Whitney Museum of American Art, New York, with the involvement of Carrie Springer, Assistant Curator, Whitney Museum of American Art, New York. 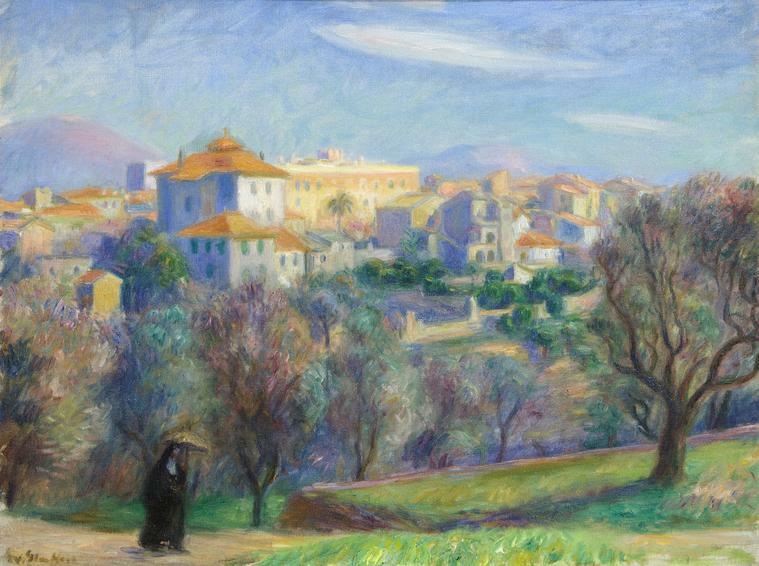 Throughout his career, Stella has challenged the boundaries of painting and accepted notions of style. Though his early work allied him with the emerging minimalist approach, Stella’s style has evolved to become more complex and dynamic over the years as he has continued his investigation into the nature of abstract painting. 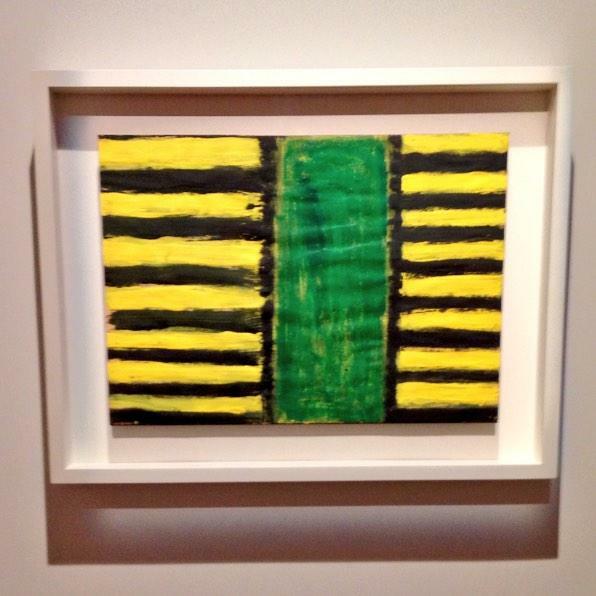 East Broadway (1958), from the collection of Addison Gallery of American Art, which show Stella’s absorption of Abstract Expressionism and predilections for colors and composition that would appear throughout the artist’s career. The Marriage of Reason and Squalor II (1959) from The Museum of Modern Art’s collection. A selection of the artist’s Aluminum and Copper Paintings of 1960–61, featuring metallic paint and shaped canvases, further establish Stella’s key role in the development of American Minimalism. including the masterpiece Jasper’s Dilemma (1962). In his Dartmouth, Notched V, and Running V paintings, Stella combines often shocking color with complex shaped canvases that mirror the increasingly dynamic movement of his painted bands. Harran II (1967) from the Guggenheim's collection, composed of curvilinear forms with complex chromatic variations. The Polish Village series marks the beginning of Stella’s work in collage. He begins to increasingly incorporate various materials into large scale constructions in order to further probe questions of surface, line, and geometry. In Bechhofen (1972), from the San Francisco Museum of Modern Art, the interlocking geometric planes of unpainted wood stretch the purely pictorial into literal space. St. Michael’s Counterguard (1984) from the Los Angeles County Museum of Art, address this interest. 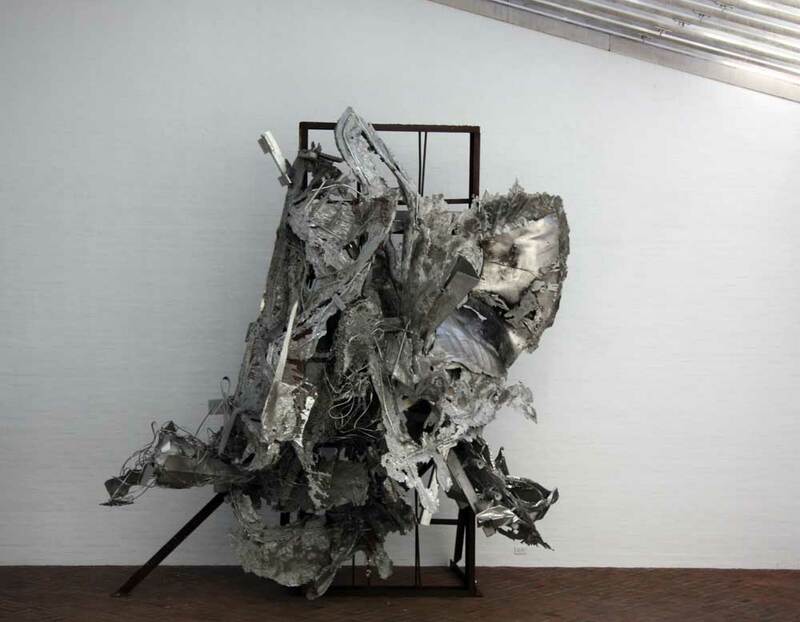 In these works, sheets of cut metal project out from the picture plane, creating gestures that are further activated with drawing and the addition of various reflective materials. The radical physical and material nature of these works was quite influential to a younger generation of painters in the 1980s. In the last thirty years, much of Stella’s work has been related in spirit to literature and music. The complexity of this series, made primarily in metallic relief with fabricated, cast, and found parts; prints; and freestanding sculpture, is a tour de force. and The Grand Armada (IRS-6, IX) (1989) from the Fondation Beyeler, Riehen/Basel, suggest visual elements, such as waves and fins, which recur in Melville’s narrative. and the mural-size painting Earthquake in Chile (1999), (right detail above) part of the artist’s Heinrich von Kleist series (1996–2008), which take as their point of departure the writings of the early nineteenth-century German author. extraordinary metal reliefs from his Bali series (2002–2009), as well as the lightweight and dynamic sculpture from his Scarlatti Sonata Kirkpatric series (2006–present), whose delicacy and intricacy suggest the musical compositions of the Baroque master, represent the final segment of the exhibition. In many of these works Stella has used computer generated images and modeling to extend the complexity, layers, and allusions of his material process well beyond traditional media for painting and sculpture. 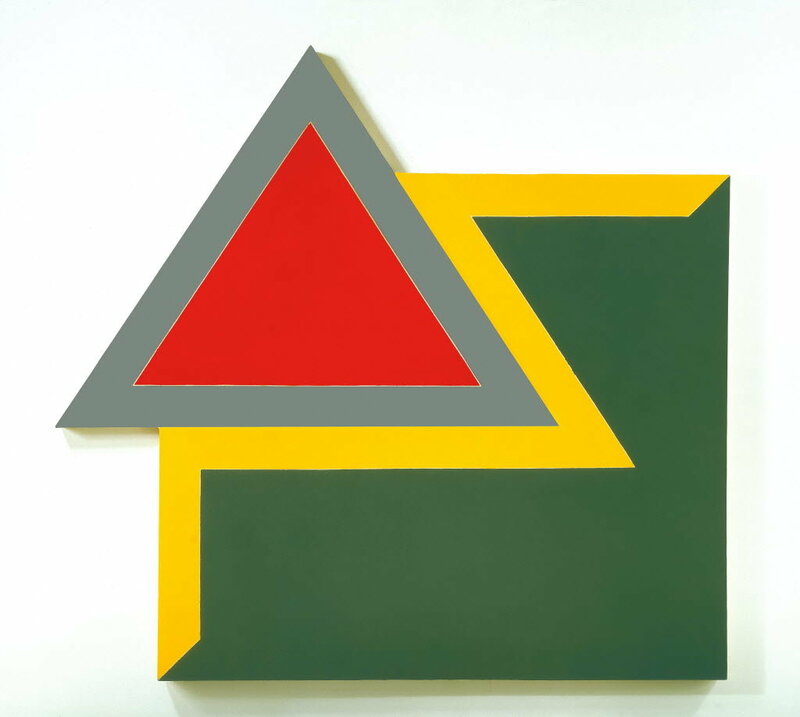 Frank Stella: A Retrospective underscores the important role Stella’s work plays within the art historical framework of the last half century. It provides a rare opportunity for viewers to discover the visual and conceptual connections within the extraordinarily expansive and generative body of work of an artist restless with new ideas. 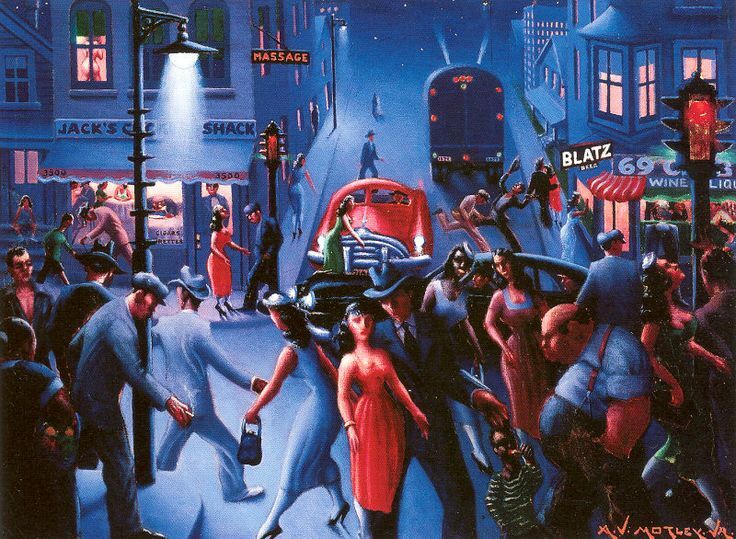 Born in Malden, Massachusetts, in 1936, Stella attended Phillips Academy, Andover, and then Princeton University, where he studied art history and painting. In college, he produced a number of sophisticated paintings that demonstrated his understanding of the various vocabularies that had brought abstract painting into international prominence. After graduating in 1958, Stella moved to New York and achieved almost immediate fame with his Black Paintings (1958–60), which were included in The Museum of Modern Art’s seminal exhibition Sixteen Americans in 1959–60. The Leo Castelli Gallery in New York held Stella’s first one-person show in 1962. The Museum of Modern Art, under William Rubin’s stewardship, presented his first retrospective only a few years later, in 1970, when Stella was only thirty-four years old. A second retrospective was held at MoMA in 1987. Since then, Stella has been the subject of countless exhibitions throughout the world, including a major retrospective in Wolfsburg in 2012. 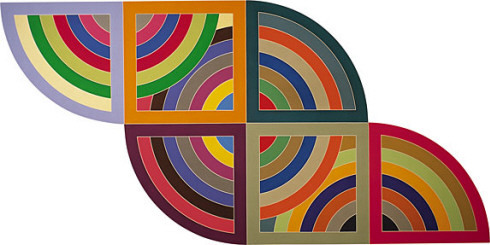 Frank Stella: A Retrospective is the first survey of the artist’s career in the U.S. since 1987. He was appointed the Charles Eliot Norton Professor of Poetry at Harvard University in 1983. “Working Space,” his provocative lecture series (later published as a book), addresses the issue of pictorial space in postmodern art. Stella has been the recipient of numerous awards and honors, including the 2009 National Medal of Arts and the 2011 Lifetime Achievement in Contemporary Sculpture Award from the International Sculpture Center, as well as the Isabella and Theodor Dalenson Lifetime Achievement Award from Americans for the Arts (2011) and the National Artist Award at the Anderson Ranch Arts Center in Aspen (2015). 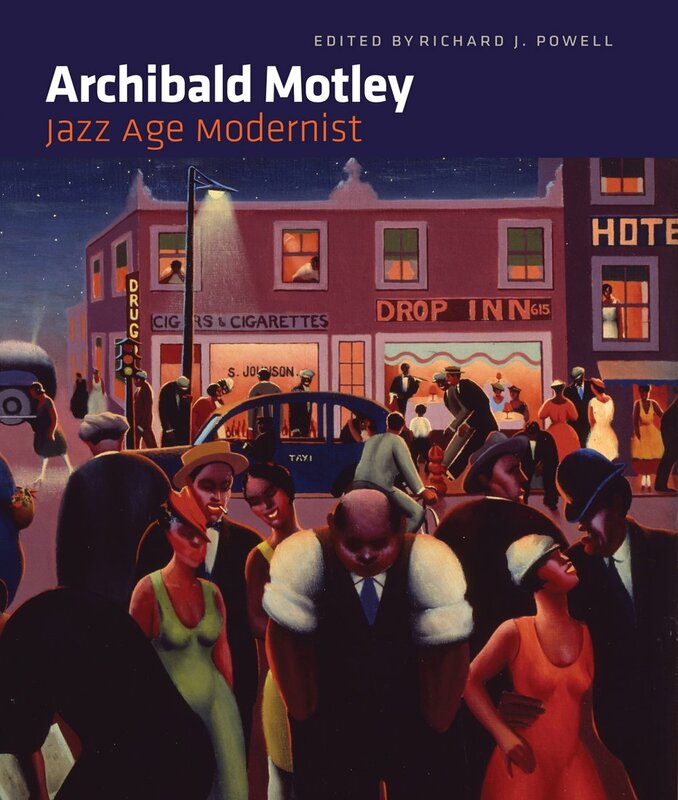 The exhibition is accompanied by a fully illustrated scholarly catalogue, published by the Modern Art Museum of Fort Worth, the Whitney Museum of American Art, and Yale University Press. 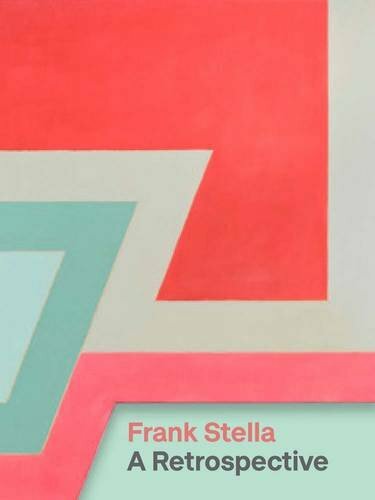 The publication addresses in depth such themes as the artist’s complex balancing of expressionist gesture and geometric structure, his catholic referencing of the history of art (abstract, figurative, and decorative), the importance of seriality in Stella’s process, and his work’s impact on subsequent generations of American artists. The catalogue includes an essay by Michael Auping that encompasses Stella’s entire artistic output and connects the many different series and transitions in the artist’s 60-year career. Adam Weinberg addresses Stella’s formative years at Andover and Princeton and his earliest influences. Art historian and artist Jordan Kantor contributes an essay about the artist’s more recent work, and artist Laura Owens interviews Stella. Stella’s highly articulate Pratt Lecture (1960) is also included. The book concludes with a substantial chronology.